(Newser) – He faced execution for failure to perform. But Benjy, the gay bull of Ireland, has been saved following a worldwide appeal backed by The Simpsons co-creator Sam Simon. Ireland's Animal Rights Action Network says Simon is helping pay for Benjy's transportation to an animal sanctuary in England. Simon, who is battling colon cancer, has been giving away much of his fortune and is a leading donor to animal welfare causes. 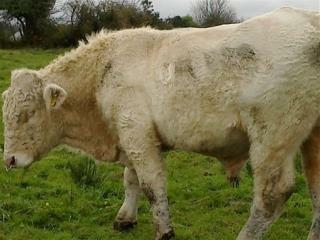 Benjy, a Charolais bull, failed this year to impregnate any heifers at a County Mayo farm. Veterinarians determined he was fertile, but was more attracted to the bull that replaced him. We don't want to eat it, it could have AIDS. He could have been offered a chance to mate with Chaz Bono and turned it down. The bull should be brought to san francisco and made grand marshall of the gay pride parade next year. Moo to you too. So this bull was saved only because he was gay? That's messed up!